Sour taste is the body's way of identifying acid, so if your candy tastes sour, it contains acid. Dissolve the candy in a small amount of warm water (about a half-cup or less). For hard candy like Smarties, you may want to crush it first to make it dissolve faster. For more fun, try testing candy like Skittles, StarBursts, or Sweet Tarts. Do these candies contain as much acid as really sour candies? *If the candy is taking too long to dissolve, try crushing it first. You can also get quick results using Pixy Stix or candy covered by sour powder. Were there a lot of bubbles? We saw a few and not for very long. Some there were no bubbles at all. Curious to know what your results were. In general, the more sour your candy, the more bubbles you will get (because it contains more acid). Skittles and Starbursts produce a few bubbles, Nerds produce more, and sour coated candy such as Warheads and Sour Patch Kids produce the most. Unless the sour coating is on the outside, make sure the candy dissolves before you add the baking soda. If the whole candy is sour, the more it dissolves the more bubbles you will see when you test it. You might invite your child to sort the candy by predicting which will produce the most bubbles, based on how sour they are. Then dissolve each candy in a separate cup and add baking soda to test your predictions. I adore your site! I just posted a link to yours on my blog: creatingcuriouskids.wordpress.com Here's to candy science! Curious kids are what got us started on candy experiments in the first place, so hooray for scientific curiosity. Thanks for the note! That would be fun--let me know how it goes! Here's what we did last year for an Acid Test science fair experiment. I've been trying to keep my online experiments simple so they're easy to follow, but my book Candy Experiments, coming out next year, will have lots more of these kinds of experiments. Don't worry, they'll still be fun! does normal cabbage work too? If you're asking about making a cabbage indicator to test for acidity, the cabbage needs to be purple so that you can see the color change. It's pretty easy to do--chop up some purple cabbage and boil it, then strain it and keep the water as indicator (or, if you have your kids do it, have them rip up the cabbage and let it soak in water for an hour). When you add acid to the indicator, it should turn pink; if you add a base (like baking soda) it should turn blue. Hello my daughter came across your experiment and she wants to try it for her science project my we use it please. She said if you let her she's putting you down for the background research. That would be fine. Let me know how it goes! May I please use the experiment for my science project. Yes. Thanks for asking, and let me know how it goes! Please cite www.candyexperiments.com as your source for the idea. Hi my son is very interested in doing this experiment for his science project, would that be okay. That would be great. Let me know how it goes! Loralee. My son loves this experiment and we are doing this for science fair. May we please reference the information on this page. We would post it on his board, reference it on this video we are making (they get to incorporate ipads into the presentation) and put it in the report. We would ensure that your work is correctly cited. We are testing war head, smarties, lemon heads, now and laters, sour crawlers, and jelly beans. I had him taste the candies and rate how sour they were and then we read the label to find out what kind(s) of acid was used to make the candies. Go ahead. Thank you so much for asking! I would love to hear what your results are, and how your testing compares to his tasting. Go ahead, and thanks for checking. Would love to use the this experiment for a STEM enrichment program I teacher at a local preschool. I always send written material home with the kids and will happily add your site to that material. Is this OK? Go ahead and use this for your preschool. On your written material, please include the book title as well as the website. Thank you so much for asking, and let me know how it goes! Hi! My experiment didn't have much bubbles but I didnt see it. My partner did it. I asked u if I could use it already. Guess who I am?????? --dissolve the candy in warm or hot water. This will help it dissolve better. Dissolve as much as you can, at least of the sour part. --make sure you are using equal amounts of each candy. You might want to weigh each sample. --add the baking soda after the candy is dissolved. You can also mix some baking soda and water together until the baking soda dissolves completely, then add an equal spoonful of that to each bowl. This ensures that you've added exactly the same amount of baking soda to each sample. --Most candies don't produce very many bubbles. So watch closely. Good luck! Good Evening! I have stumbled on to your wonderful site in exploration for experiments to use with my K-5 gifted program students this week after Easter. I specifically want to use candy and am excited to have found so many ideal suggestions. I would like permission to use the acids test, the floating m's and s's, and the sink/float with my various levels of students. Thank you for making this so easy to follow! You have my permission to use the above experiments in the way you describe. 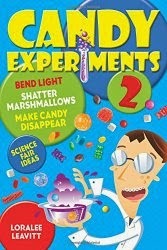 Please tell your students that the experiments are from www.candyexperiments.com, and let me know how it goes! Hi! My daughter would like to use this project for her science experiment. We will reference your site on our board! Is this OK? Thanks! That's fine. Thanks for asking, and let me know how it goes! Go for it. Please let me know how it goes! Hi Loralee, your ideas here are really great! I am interested in doing the candy acid test for a science demo for children. I wanted to ask if it is okay to do this. I would of course reference your website as the source of the idea. I'm planning on doing a slight variation - mix the baking soda in water, then let the kids drop in different candies (whole or crushed as needed). Let me know! Thanks for asking permission. Go ahead, and let me know how it goes. One thing about your proposed variation is that this doesn't work for a lot of candies. It is awesome with Warheads and Pixie Sticks. Otherwise, there isn't enough acid in many candies to see an immediate reaction as it dissolves from the outside in. That's why, when I'm doing comparisons, I like to dissolve the candy first so that all of the acid is in the solution and can react immediately. You don't get that many bubbles unless the candy is really super sour. Hi Loralee, thanks for giving me permission for this and sorry for the long response time! The activity went well. You definitely had to look closely to see bubbles for some of them (gummy bears for example), but for others (Sour Patches for example), the bubbles were obvious. It was also interesting how the bubbles formed differently for the different candies. For example, Sour Patches had lots of tiny bubbles, Smarties had fewer bubbles but they were larger, and bubbles from Sour Tarts were plentiful but had a delayed response time and didn't last as long. Just wanted to let you know how it went and thanks for the info in your website! Hi Loralee! I am an intern teacher and I was hoping to use your lesson for a group of 2nd graders? I thought it would be a fun experiment to do since halloween is over. I plan on using warheads, sour patch kids,Swedish fish and gobstoppers for the candy. Go for it! One thought: Swedish fish won't dissolve very well, so they won't be easy to test. My son would like to do a science fair project based upon your concept/procedure. He would pick a list of different candies based upon his preference, but would like to use your concept of mixing with warm water and placing baking soda to see if any of them general bubbles. Would that be allowed? I forgot to add. My son will reference your site as a source if given permission.Thanks for the consideration. How can I properly reference your site so as not to plagiarize your work? I am doing this experiment with my 6 year old for an "observation" science fair project. FIrst of all, thanks for getting in touch and asking the question. I ask that you list the website, i.e. If you want to get more technical, or the teachers require citations in a certain format, plug everything in to the Citation Machine. My kids use it all the time. Go ahead. Let me know how it goes! Is it ok if I put this in my sources for my science fair project? My Son would like to use this for his science fair, Is that ok? Hi Loralee I have two daughters who interesting in trying out the pixy stick challenge for their science project. May we use some of your ideas and research? Go ahead and enjoy! Let me know how it goes. Go ahead, and thank you for citing my website!